Dental implant treatment replaces teeth using a modern approach, restoring bite function and a natural appearance. 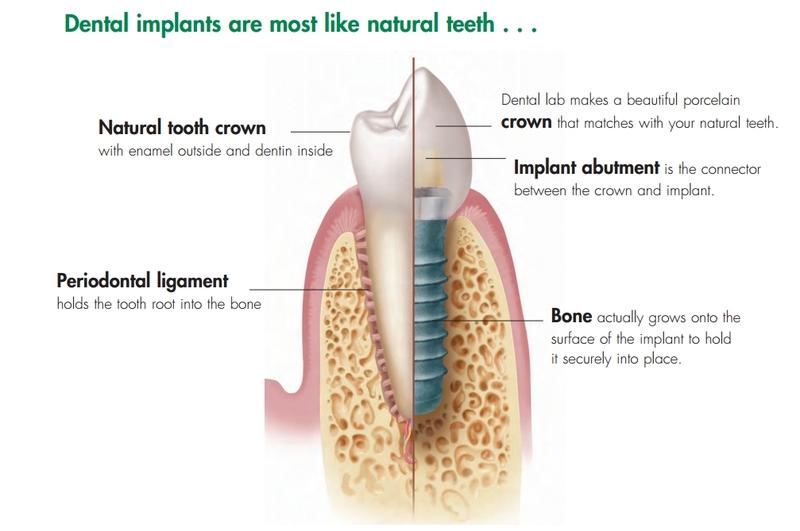 With dental implants, patients have the opportunity to restore a bite that feels and looks natural. Whether you have single or multiple teeth missing, you can have those gaps filled and achieve a comfortable bite. This treatment is an alternative to traditional dentures, partials, or bridges, which require maintenance over time to properly fit the smile. Dental implants and restorations are designed to last for years, offering the benefits of premium materials that make your bite normal and your smile beautiful. Losing one or more of your teeth creates a gap in your smile, affects your ability to chew properly, and can alter your diet and nutrition. While these are all serious issues. Did you know that tooth loss also leads to bone loss? Individual Crowns – These replace single tooth gaps, or teeth sporadically missing throughout the smile. Crowns are made from porcelain, which makes for a natural look and exhibits strength nearly on par with real teeth. Bridges – When you have multiple teeth in a row missing, implants provide an anchor to support a longer line of teeth. Unlike traditional bridges, healthy teeth are left intact, and the restoration fits seamlessly in your smile. Hybrid Dentures – Implant-supported dentures are permanently attached in your smile, effectively restoring whole rows of teeth. These can be applied to both upper and lower arches, rebuilding dental function. For a full set of teeth that won’t fall out, consider how hybrid dentures can assist you. To see if dental implant treatment is right for you, schedule a consultation at our practice. Dr. Sani will perform a thorough medical History and dental examination to begin the process of your implant placement. Our experienced dentist, Dr. Sani, will help you obtain a comfortable bite and a healthy smile again. We look forward to hearing from you!